BlackBerry Bold to be released mid October | BlackBerry Blast! Everyone has been guessing on the release date for the BlackBerry Bold in the US. We've heard rumors of September and October releases. Now comes more evidence that the BlackBerry Bold will hit the US the week of October 20. 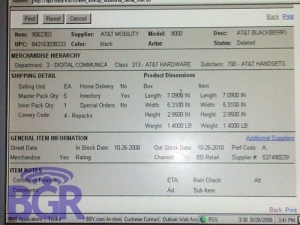 BGR has come up with a screen shot of Best Buy's internal system that shows a release date of October 26, 2008. If that is indeed the case, the BlackBerry Bold should actually be out in the US at least a week before it hits Best Buy. Pricing is expected to be arond $600 according to BGR.